Editor’s Note: The Hearing Disruptions series seeks to cover the rapid changes taking place in hearing healthcare. Today’s post is culled from recent topics presented to the Institute of Medicine’s (IOM) Committee on Accessible and Affordable Hearing Health Care for Adults. Holly Hosford-Dunn. Based upon an address presented June 30, 2015 at the Committee on Accessible and Affordable Hearing Health Care at the Institute of Medicine, Washington, DC. PSAPs emerged in the 1990s as an economic substitute1 for a hearing aid, like margarine for butter. 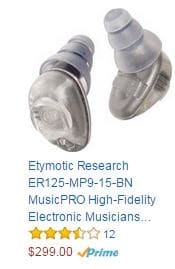 Then and now, PSAPs often look like hearing aids (Fig 1). Functionally, their technology has continually ramped up so that some PSAPs in today’s market act like hearing aids as well. From the market’s point of view, PSAPs and hearings aids are by and large undifferentiated in appearance and features. 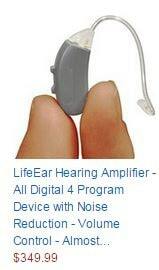 But the FDA differentiates PSAPs by defining them as occupying the negative space surrounding traditional hearing aids: they’re for non-hearing impaired persons and not for mitigating hearing loss.2 The FDA’s is a wellness approach, but it sends a confusing message to consumers, especially those with hearing loss, and the hearing healthcare industry in general. 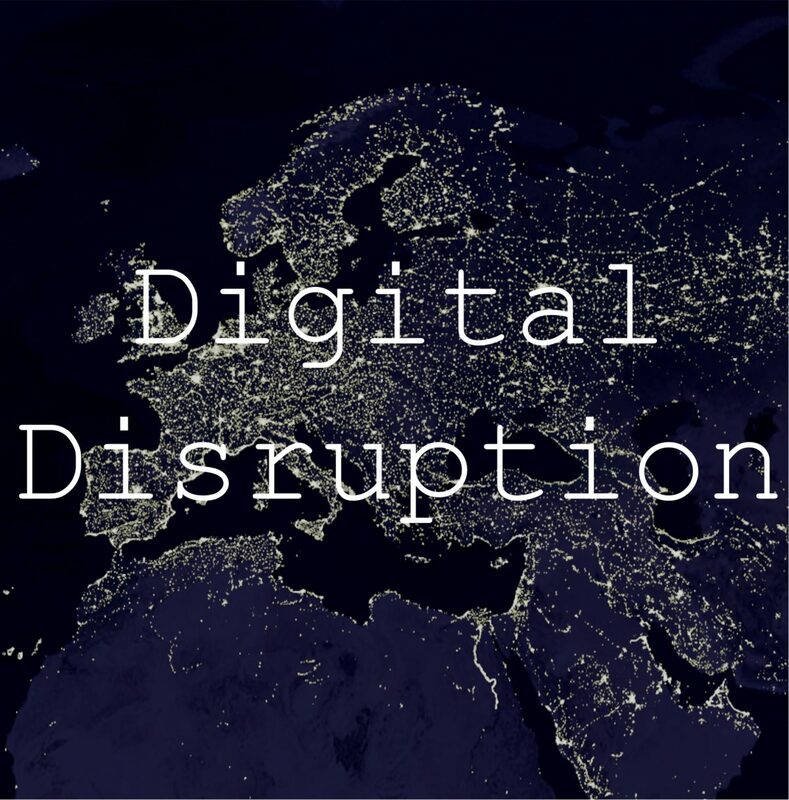 On the other hand, the line in the sand enables differentiation of “ear amplifier” devices by price, which is markedly lower– anchored around $299– and by distribution channels, which largely bypass licensed practitioners and bricks and mortar locations. Fig 2. PSAP with looks and characteristics designed to leverage the wellness definition. Some PSAPs build on the wellness definition to appeal to a wider swath of consumers who want speech clarity and distortion-free music appreciation in instruments that look more like wireless earbuds than traditional hearing aids (Fig 2). These devices make the case that some ear amplifiers in today’s market are neither substitute nor inferior goods. Rather, they are the first shots fired from the consumer electronics industry in what’s become popularly known as Hearables. Converging technologies and diverging distribution channels make it difficult to define, much less measure, actual market demand for PSAPs. To say we lack data is a huge understatement. What little there is about PSAPs in the hearing aid industry comes from a few hints in the 2008 and 2014 MarkeTrak (MTVIII and MT9) surveys, both of which identify the markets as upwards of 30M US adults who self report Hearing Difficulty (HD). Twenty-five to thirty percent of those report using hearing aids, and based on the manner in which they’re obtained it seems likely that a little over 3% are PSAPs of some sort.4,5 See Table 1. Table 1. 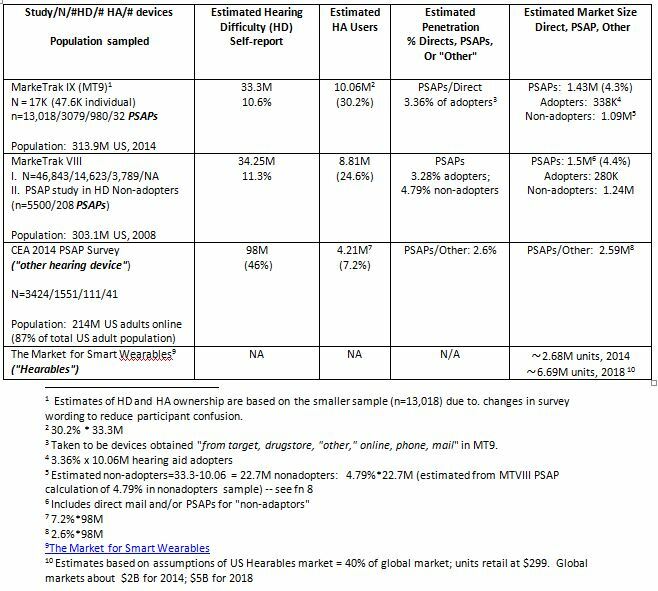 Estimates and speculation on the PSAP/Hearables market. The 2008 MT survey surmised that just under 5% of those who perceive HD and who don’t adopt hearing aids were using PSAPs. That brings the total estimated PSAP market to at least 1.5 M adult US users in today’s market, perhaps approaching 5% of the market among those who perceive HD . That is a low penetration for a low priced substitute, possibly reflecting stigma associated with perceived inferior goods, certainly reflecting the inertia characteristic of the fairly static hearing aid market from 2008 – 2014. Next week, a repeat of Table 1 for Hearables, Up and Coming. 1Substitute good: as the price of hearing aids goes up, the demand for its lower-priced substitute good, the PSAP also goes up. 2PSAPS are 1) wearable electronics, 2) amplifiers for sound experience by many in everyday life, which include hunting, birding, lectures/distant speakers, soft sounds. (Paraphrase of FDA Guidance draft guidance document p 11). 3Inferior goods have negative income elasticity of demand (as income increases, quantity demanded decreases).